Katrin Gabriel has been a violin maker and restorer for over 35 years. During that time she has had the privilege of working on many very fine antique instruments. Transforming these instruments back to their original glory has always been a very rewarding experience and given her immense satisfaction. Katrin Gabriel grew up in a family of classical music lovers in Berlin. She started to play the cello aged eight and continued to have lessons until the age of eighteen. She was a keen member of several orchestras and also played in a string quartett. 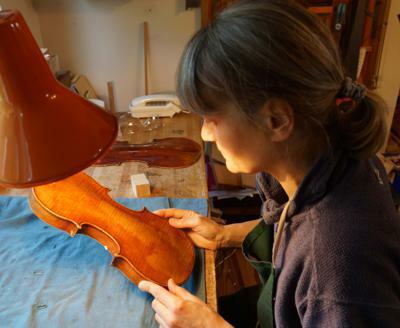 Her love of wood working combined with her Cello playing led her to apply at the School for Violin Making in Mittenwald, where she trained for three and a half years. During that time she continued her orchestral playing and formed a string quartett with three other college students as well as playing duos. After graduating from the Violin Making College in Mittenwald she took on a position as violin restorer in Cologne with H&W Buennagel, where she continued to work for over four years, later becoming their workshop manager. She then moved to London joining the team of restorers at Edward Withers Ltd under Adam Whone, first in Wardour Street and then Windmill Street. During her time there she briefly returned to Germany to take her Master Violin Maker Exam in 1993 before continuing to work at Withers Ltd. In 1995 she started her own violin making and restoration workshop in London, from where she worked with leading London Violin restorers and dealers including Andreas Woywod, Peter Biddulph, J.P. Guivier, Sotheby's musical instrument department, now Ingles&Hayday and Eckhard Kropfreiter. Katrin has also worked extensively with private clients, musicians and teachers as well as auction houses. Katrin now lives and works in Herefordshire, whilst still retaining strong ties to London. She continues to work with musicians from all over the world, as well as dealers and London auction houses.